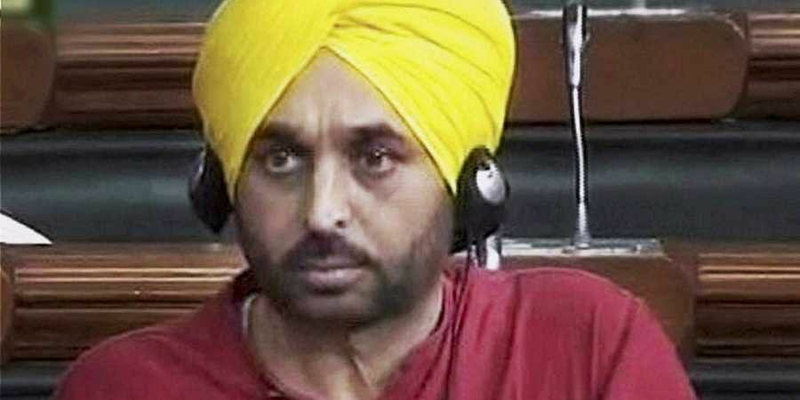 Senior AAP leader and Sangrur MP Bhagwant Mann said he has left drinking from January 1 and that he hopes to shun liquor for the rest of his life. BARNALA: Senior AAP leader and Sangrur MP Bhagwant Mann on Sunday said he has left taking liquor on his mother's advice. Mann, who is often criticised by political opponents for "excessive drinking," earned high praise from party supremo Arvind Kejriwal for giving up alcohol. "My political opponents often level accusations against me, saying 'Bhagwant Mann takes liquor and remains intoxicated day and night'. Brothers, it always pained me when I saw old videos of myself on social media where I was being defamed," Mann said, at a rally here. He said he has left drinking from January 1 and that he hopes to shun liquor for the rest of his life. "I admit I used to take liquor occasionally. But my political opponents maligned me. Today my mother is here. She had told me that people defamed me excessively on the television and then asked me to stop taking liquor. Now they cannot defame me," said Mann, who is set contest the Lok Sabha elections from Sangrur seat again. In 2016, the suspended AAP MP Harinder Singh Khalsa had complained against Mann to Lok Sabha Speaker Sumitra Mahajan, requesting her to change his seat in the Parliament as Mann, who sat next to him, was stinking of alcohol. Later during his address, Kejriwal lauded Mann for leaving liquor, saying his commitment was "not a small thing". "Friends, Bhagwant Mann has won my heart. Not only mine, he also won the hearts of whole Punjab. A leader should be like him who is ready to make any kind of sacrifice for the people. It is not a small thing to make such a big commitment. After January 1, he says he will not touch liquor. It is a very big thing," said Kejriwal. Kejriwal said Mann, who was a stand up comedian, left his career to serve the people of Punjab. "Today Punjab is sinking because of drugs. In the last Punjab elections, Mann fought against Sukhbir Singh Badal from Jalalabad seat because he felt at that time Sukhbir was the biggest guilty for the situation Punjab was in. Today, Sukhbir Badal is responsible for drugs in Punjab," alleged Kejriwal. Kejriwal asked how many people are ready to leave liquor for the people. Earlier in his speech, Mann claimed nobody could blame him for embezzling even a single penny. He also lashed out at SAD and Congress in his address. Meanwhile, talking to reporters Kejriwal said AAP would contest all 13 Lok Sabha seats in Punjab. "We will contest all 13 seats in Punjab. There will be no alliance with the Congress in Delhi or in Punjab. People were earlier fed up with the Akali Dal and now with the Congress as they failed to honour any poll promise. We will carry out the same work in Punjab as we have done in Delhi," said Kejriwal. During the rally, Mann announced former union minister Harmohan Dhawan would be the party candidate from Chandigarh seat for the upcoming Lok Sabha elections. Dhawan had joined AAP last year.